Four people explore an abandoned insane asylum and encounter haunting hallucinations from the past that unlock a dark secret. Originally built in 1832, Michigan’s Eloise facility grew to become the largest insane asylum in the U.S. Amid rumors of inhumane testing and patient mistreatment by Head of Psychiatry Dr. H.H. Greiss, a devastating fire that killed the doctor and multiple patients closed Eloise permanently in 1982. In the present, Detective Frazier interviews Pia Carter about her recent urban exploration of Eloise’s crumbling buildings. Detective Frazier confirms that children found the dead body of Dell Richards as well as the presumed remains of Pia’s brother Scott. However, Jacob Martin remains missing. Several days earlier, mechanic Jacob Martin is summoned to Detroit by attorney Arlen Davies with the news that Jacob’s father Isaac died by cutting his own throat. Jacob stands to inherit a large sum of money as sole heir. However, Jacob has to prove that Isaac’s sister Genevieve, a former Eloise patient, died in the 1982 fire by retrieving her death certificate. Jacob and his longtime friend Dell Richards go out drinking and meet bartender Pia. Jacob tells Dell he can help with Dell’s debt problem if his aunt’s death certificate can be recovered. Jacob hits a wall of red tape when he goes to Eloise’s administration office and learns he needs a court order to retrieve the death certificate from an annex. Dell contacts eccentric amateur historian Scott Carter, whose mother was a nurse at the asylum, to help them find the Eloise annex. Jacob and Dell discover Scott’s sister is Pia, and she insists on coming along to watch out for her brother. Jacob, Dell, Scott, and Pia sneak into Eloise at night to look for the death certificate. As they explore, they encounter haunting visions from the past, including Pia seeing a young girl holding a mysterious box. Scott falls through several floors and ends up captured by orderlies who restrain him to a gurney. The medical staff performs a painful procedure that kills Scott. Dell fires his gun wildly at his hallucinations as he runs through the halls. Dell eventually becomes trapped in a room of rising water and drowns. Jacob and Pia are also seemingly transported into the hospital’s past and are captured. For the benefit of his students, Dr. Greiss prepares to demonstrate his fear confrontation therapy by exploiting Jacob’s claustrophobia and Pia’s fear of injections. Pia wrestles free of her restraints. Disguised as a nurse, Pia is able to free Jacob from his confinement in a mortuary slab. Jacob and Pia discover that Genevieve gave birth on Jacob’s birthday, which was the same day as the 1982 fire. Jacob and Pia watch as Dr. Greiss delivers the baby. They realize that Genevieve is really Jacob’s mother and Dr. Greiss is his father. Pia’s mother, Nurse Carter, vows to help Genevieve’s child escape the asylum. Nurse Carter changes the paperwork and then hides baby Jacob in a box. Nurse Carter then gives the box to young Pia to take outside to Genevieve’s brother Isaac. When the baby is discovered missing, Dr. Greiss orders an immediate search. To aid in the escape, Jacob starts a fire to provide a distraction. Young Pia successfully gets the baby to Isaac in the commotion, but Jacob and adult Pia are recaptured. However, Pia returns to the present day where the orderlies become firefighters battling a new blaze consuming Eloise. Pia remains unresponsive to Detective Frazier’s questions. He gives her a box of photographs that she reflects upon. Meanwhile, Jacob is stuck in the past as Dr. Greiss’ captive. 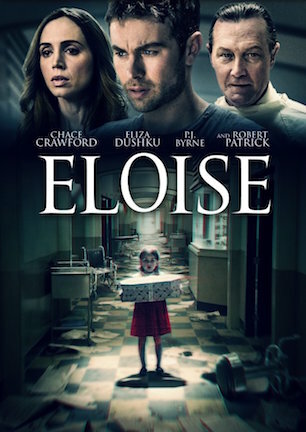 I nearly overlooked “Eloise” because the title sounds like a British melodrama where Jim Broadbent cares for a beloved wife dying of leukemia, or a screwball comedy with Melissa McCarthy in old age makeup playing a goofy granny. Would that it were, since I could have spared 90 minutes by knowing enough to move right along. Instead I spent it on a stale psychological thriller, which is what “Eloise” actually is. You might not think ‘Eloise’ would be the name of a noted mental institution either, yet that’s where it comes from. Taking its name from the daughter of Detroit’s postmaster circa 1894, the real Eloise in Michigan was once the largest psychiatric complex of its kind, peaking at 78 buildings during its prime. Services ceased entirely by 1984, with only four buildings having survived the weather and wrecking balls since. Nothing nefarious happened in Eloise’s 145 years of operation. Nothing documented in known records or history texts, at any rate. This requires the movie bearing its name to take a little liberty by putting a provocative punctuation mark on the facility’s final days. Eloise’s fictional end involves a sinister doctor performing secret experiments, and a mysterious fire that tore it all down in 1982. With a premise involving four thirtysomethings trespassing at night in an abandoned, allegedly haunted insane asylum, one might jump to the conclusion that “Eloise” is “found footage.” It isn’t. It’s even more derivative than that. Jacob just learned his estranged father Isaac died in a gruesome throat-slitting suicide. Almost as surprising as the manner of death is the revelation that Jacob stands to inherit a seven-figure sum. There’s only one catch. Jacob has to prove he is Isaac’s sole heir, and Isaac’s sister Genevieve met an unknown end as a patient at Eloise. Jacob is going to need Genevieve’s death certificate in order to lay hands on the cash. Luckily, Eloise still staffs an administration building, apparently for times like this when someone needs a paper patient file from the archives. Unluckily, red tape requires a court order to unlock the annex where records are kept, and Jacob doesn’t have seven months to wait. Jacob’s pal Dell recruits an amateur local historian who can help them navigate the labyrinthine campus and find the elusive annex on their own. Trouble is, Eloise expert Scott is an eccentric sort of head case. So Scott needs his attractive sister Pia, whom Jacob conveniently met at a bar the prior evening, to come along with her watchful eye. Under cover of darkness, the quartet enters Eloise and their urban exploration begins. Supernatural shenanigans start up too, as the foursome is beset by haunting hallucinations that somehow transport them to the asylum’s past. Jacob, Dell, Scott, and Pia soon find themselves facing aggressive orderlies, mad inmates, and madder medical personnel. Two timelines are colliding to reveal the truth behind Jacob’s family history, as well as what really took place within the walls of Eloise. I’m miffed at myself for concocting a recap that makes the movie sound somewhat intriguing when it is anything but. The main mystery is what recognizable names like Eliza Dushku, Chace Crawford, and Robert Patrick were thinking when they agreed to appear in pure potboiler fare. With neither a single scare nor notable moment making some sort of mark, “Eloise” isn’t a highlight for anyone’s résumé. Supposedly spooky sequences of spelunking are achieved with a moth-eaten bag of tricks. A lot of flashlight beams swing across scattered papers in dark corridors. Blue light flickers so frequently from a lightning storm through the windows, you’d think competing fireworks displays were at war with each other outside. Layer in generic audio effects like punching fist thuds and creaky doors opening and it seems “Eloise” can’t conjure a sight or sound that doesn’t come from somewhere else. The climax comes close to tying the story together with a pinch of unexpected creativity. Until you realize how ludicrously improbable the path of the plot is, and how the unlikely coincidences carrying everything to that point only bring boredom in the meantime. “Eloise” is almost passable, except its forgettable script and flat style, like an obsession with Steadicam circles whenever someone is surrounded or confronting a vision, cement it too deep in lethargic routine. It’s enough to make anyone wish “Eloise” had been that Melissa McCarthy romp or Jim Broadbent tearjerker after all. February 3, 2017 by Ian Sedensky.